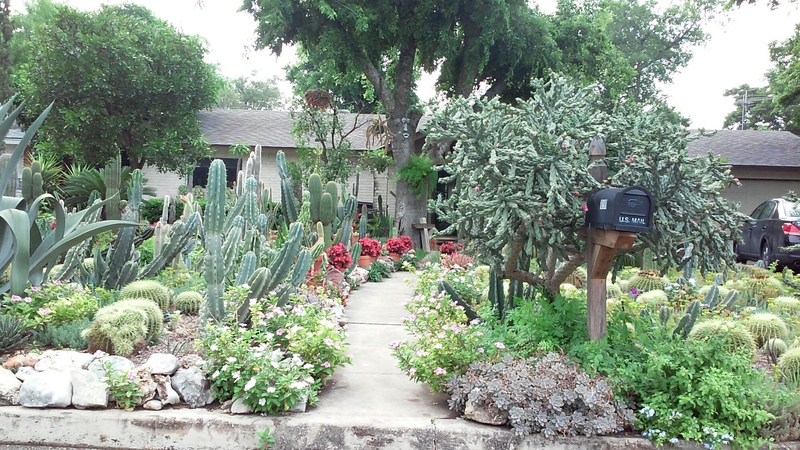 …a living example of hardy cactus for San Antonio! This is lovely – I have one cholla plant and I struggle over where to keep it. In the ground in a bed (where it is currently) it is dangerous to weed around, but I don’t have a spot for a pot large enough to give it room to grow. Which leads me to wonder – these bedding areas look to be weed free. How in the world is that accomplished?! Super long tongs? The owners are gymnasts – or perhaps contortionists? I am as impressed with how tidy it all remains as I am with the no watering, frankly. (Well – and with how beautiful it is for those of us who admire spiky plants…). That is a good garden find…do you know I still hear people, even clients, who say they don’t want (cactus, agaves, thorny plants, …)? Not sure what they are thinking, let alone when it’s a dry year. Yet more proof to do more of this, design it well, and maintain it…and let others get lost. So well done and nicely kept. The annuals add a nice dimension. They wouldn’t need to water this year, some of my xeric plants are looking a bit water logged at this point! That’s very pretty, although a bit of a dicey entry between cholla and the other cactus. Yikes! Beautiful! Us Portlanders mostly have to keep our cactii and succulents in containers so they can go into our basement to overwinter. This yard is fantastic. Looks awesome Heather.hard to believe they can get so big with so little water.